Dynamic Balance Equestrian is Lyz Rudolph-Michaels, a horse trainer, coach, and animal structural alignment specialist. Lyz works in two ways: teaching people to communicate clearly and effectively with their horses, and working with the horses to help improve their performance, comfort, and freedom of movement. Dynamic Balance clients are people who are willing to do what it takes to have happy, healthy horses. The result of our work is enhanced relationships between people and horses. Lyz has been involved with horses her whole life and discovered a passion for coaching in her late teens after the purchase of her first horse. Dynamic Balance Equestrian was established in 2004 and has been evolving ever since. In 2010 Lyz became a certified Equine Therapist and structural alignment therapy is now the main focus of her work. She still offers coaching and training but has shifted to a more alignment related riding style. 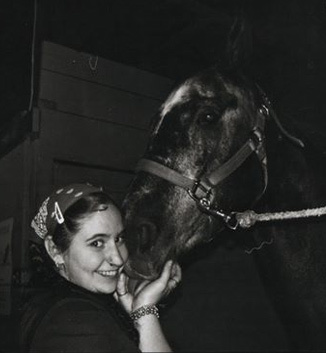 Lyz has taught riders and horsepeople of all ages and disciplines and has worked with horses of all breeds and types. Structural alignment can benefit every animal, allowing peak performance free of pain, discomfort and tension. Whether you are looking to alleviate a chronic or acute injury, strengthen a weakness, or just looking to give your companion an enjoyable, refreshing experience, Dynamic Balance Equestrian is happy to help. “Lyz from Dynamic Balance Equestrian was recommended to us by a number of people when we were looking to have some work done on our miniature gelding who was walking very wide and stiff behind. Lyz was very knowledgeable and professional, she was very good with our little guy and as well as working on him she gave us exercises, stretches and massages that we could do between her visits. “It has been almost 4 years since Lyz first came out to see my QH mare. My horse sustained some major trauma that Lyz helped us work through. Lyz has adjusted my horse from head to tail, and she is now moving pain-free and balanced. We still get several adjustments a year just to keep things on track. If you think your horse is in pain or off-balance, I highly recommend you give Lyz a call and have her do an assessment. We can’t thank you enough Lyz! Diva and I have also done training with Lyz to work on our focus and balance. She is always so patient and has really helped us with our ring work. I love her positive work ethic and training methods, she’s calm and so skilled. “If you’re looking for an excellent bodyworker for your furry friend; whatever the issue, be it an injury or regular maintenance, look no further. Lyz is highly professional, very reliable, and fun to boot. She is passionate about the work she performs and she genuinely cares about your horse. My personal experiences include maintenance on two horses and a badly injured dog (hairline fracture in the neck) and all three benefited from her adjustments.